As expected, the Federal Reserve bumped the target fed funds rate another 25 basis points to 3.25%. As of today, the markets are betting that the fed will continue to raise rates until they hit 3.75%. “WASHINGTON (AP) — Rates on 30-year mortgages sank this week to their lowest level in more than a year, welcome news to prospective home buyers who face soaring home prices in many markets. The Wall Street Journal gave some interesting data about the new condos going up in Long Branch between Ocean Avenue and the beach. In one of my posts from last week, I mentioned that some of those condos are already for rent and that the rents are as cheap as $2200 per month. Given what we now know is the monthly maintenance and property tax bill, it is hard to imagine that the people playing landlord with these condos are not suffering from some serious cash flow problems. Say you are a landlord and you rent out one of these places for $2500 per month. Then you pay total monthly maintenance and property taxes of $1,343 and only net $1,157 and you haven’t even made your mortgage payment yet. Even if you took out a mortgage of only $250,000, instead of $500,000, your monthly mortgage payment would be $1,342 at a very low rate of only 5%. Needless to say, your negative cash flow each month would be about $186.00. Today’s Wall Street Journal has an article about the issue of eminent domain in Long Branch. Although on principal it seems like many of the home owners that are being forced to sell are getting shafted by the city, I can’t help but think in the long run they are better off. If we are near the peak of a housing bubble, and I think we are, those condos that are going up along the beach in Long Branch are certainly going to be worth a lot less two or three years from now than they are now. In short, the residents that are being forced out of there houses might want to quietly take the cash and gloat a few years from now that the $650,000 condo that was built where they used to live is only worth $350,000. "Ocean County added 39,542 residents from July 2000 to July 2004, a 7.7 percent increase, while Monmouth County added 19,021, a 3.1 percent increase, according to the census data. The state as a whole grew by 265,266, a 3.1 percent increase." "In Monmouth County, the old-timers remember life before the exodus from North Jersey swelled the Shore region. Tom Dancer, a lifelong resident of the Freehold-Millstone Township area, said he has seen a "tremendous amount of changes" in his 46 years. "I remember Route 537, you'd be lucky if you saw three or four cars in an hour's time," Dancer, now of Millstone Township, said. "Now, you can't even get out of your driveway on Route 537. A lot of the farms are different things (now) — commercial properties, residential properties." The Monmouth County Clerk, after a brief court injunction, is now putting deeds and mortgages up on its web page. In short, if I want to see how much a house down the street sold for, I can now look it up at the web site linked below. I'm not really sure I approve of this level of disclosure, based on privacy concerns, but its available anyway. Last week it was 2729 and the week before it was 2728 . I am attempting to keep track of the number of listings on the MLS for Eastern Monmouth County to see if a trend develops. I will try to remember to see what the number is every Wednesday. [NEW YORK (Reuters) - The chief executive of one of the top U.S. home builders, Pulte Homes Inc., on Wednesday said he saw no national housing bubble but that prices in the costliest markets could flatten or even decline. As I have argued before, the run-up in house prices in areas that shouldn’t see any increase reminds me of the run up in prices of low-growth, or no-growth companies back in 1999. Back then, maybe there was an argument to be made that Cisco should continue to trade higher because at least Cisco made money. On the other hand, companies like Webvan.com should have never even gone public, let alone see their stock prices rise 50% in one day. Similarly, maybe there is an argument that Manhattan real estate should go higher, since the city attracts tons of foreigners and it is an Island with limited places to build. On the other hand, places like Cleveland probably aren’t attracting many Italian countesses looking to pay a premium for a penthouse overlooking Lake Erie and I would imagine there are plenty of places to put up a new building. ["House price bubbles in these Midwestern cities, where manufacturing is king and activity is on the decline, flashes even bigger warning flags, in our opinion," said Sheryl King, the Merrill senior economist who wrote the report. With those kind of examples, it's easy to see how comparisons to Wall Street's technology heyday come to mind. This article makes the argument that if the Fed is going to keep printing money, than that excess liquidity is better spent on housing here, then on some television factory in China. The point is an interesting one; however, I think Roach would argue that the final result will likely be more pain than was originally intended and therefore the rampant creation of more money was/is irresponsible. Lucent is selling off its giant glass building in Holmdel, on account hardly anyone works there anymore. I propose selling the entire 470 acres to Toll Brothers, which can then build about 352 McMansions on that many 3/4 acre lots. I roughly estimate that the town of Holmdel could yield more in property taxes if the 470 acres are partitioned into small lots. Assuming about 350 lots and annual property taxes of about $10,000, which is probably conservative, I estimate the town can raise about $3.5 million per year. In 2004, the property taxes were about $3.1 million according to the article. If that plan fails, then how about putting a big shopping center there, with a Home Depot on one end, a Lowes at the other, with a Target in the middle. "Lucent hopes to make a decision about the building's future by Sept. 30. If it is sold, the company could lease a portion that it needs or move its work force to other locations, Skalko said. The company could decide not to sell the building, he said, adding, "All of our options are still open." At about 2 million square feet and sitting on 472 acres, the research building is among the largest commercial office buildings in New Jersey. However, for its size, few people work there now." We are supposed to keep track of prices in the UK and Australia because prices over there have supposedly leveled out, or in some cases, started to fall. “A surge in U.S. house prices, which have jumped 50 percent nationally in just 5 years and 12.5 percent in the past 12 months alone, started later than decade-long accelerations in the UK and Australia, which leveled off this year. The problem, still being played out in these markets and deemed a salutary lesson to U.S. homeowners, is that even the prospect of flat or low single-digit price gains may be enough to create problems for increasingly leveraged Americans. This July 1, will mark an important date in demographic history. As I have wondered here on this blog before, when the more affluent boomers start to retire en masse, will most of them sell their houses in Jersey and move to their North Carolina or Florida homes, or will they keep both houses? If they only decide to keep one house, then I would imagine a pretty decent supply of houses will be coming on-line in the next 10 years. On the other hand, if some boomers decide to live in Jersey in the summer and in Florida in the winter, then the supply of housing should be constrained. In my opinion, the boomers are going to get screwed two ways as they enter retirement. First, they will all start to draw their money out of the stock market at the same time. As prices plunge, and they can’t make ends meet, they will be forced to unload their vacation homes at rock bottom levels. “The reality is, you do not need home prices to go down – all you need is for housing prices to stop going up,” said David Rosenberg, chief North American economist for Merrill Lynch. He calculates a flattening of housing prices could trim U.S. economic growth, currently running about 3.5 percent a year, by a full percentage point." "Growing up an Italian-American boy in New Jersey in the '80s, I had to take careful precautions to avoid the dreaded Guido tag: don't grease your hair, don't listen to techno, don't drive a Camaro. Thankfully, I had no desire to do any of this, so I was never in any real danger of being lumped in with a crowd that I felt no connection to. A decade and a half ago, a site like NJGuido.com would have horrified me." Plenty of people have come up with similarities between the bubble in Internet stocks in the late 90s and today’s bubble in real estate. One similarity that I have noticed lately is the apparent interest in third-tier cities or non-vacation types of rural areas by real estate investors, and the late 1999 interest by stock investors in extremely questionable companies. In the last days of the Internet bubble, a lot of totally worthless companies got bid up because they simply had a domain name. Some of these companies, like pets.com and urbanfetch.com never had a remote chance of making any money. There only appeal to investors was that someone else might pay more for the shares than they did. This is what I believe is happening to real estate in some areas of the company. People are buying properties in very undesirable locations for the simple reason that, 1.) they can only afford to buy in that area, and 2.) someone might pay more in the future. These areas include places like Pahrump, Nevada, which is a dusty trailer park an hour and fifteen minutes from Las Vegas, Bakersfield, California and the boondocks of Maine. In short, these parts of the country should not ordinarily attract any outside interest from real estate investors and I believe that the only reason they are attracting interest is because of rampant speculation. This article is from Inman News. For some reason, Inman doesn’t leave its article up for very long. In any case, personal bankruptcy rates are supposedly on the rise in NJ and this may have the effect of keeping the foreclosure rate lower than it would be. “Personal bankruptcy filings increased in some local New Jersey markets, though demand for housing remains high in the state and homeowners in financial trouble have been able to sell their way out of foreclosure in most cases, according to an announcement today by Foreclosures.com. "Filing for bankruptcy is a common tactic used by homeowners in a bind to forestall foreclosure," said Alexis McGee, Foreclosures.com president. The company is a California-based investment advisory firm that specializes in distressed properties. A large number of homeowners may be in financial distress in Jersey City, where personal bankruptcy filings increased, according to a report by PNC bank's economic division. "Northern and central New Jersey have the highest home prices in the state," said McGee, "and the shortage of land for new development together with very low interest rates is keeping prices high. As interest rates move up, demand will slacken, but we don't foresee any collapse in prices." This Asbury Park Press article was from about two weeks ago. The whole idea of buying in Asbury is kind of appealing, but not at the prices described. No matter what the rest of the housing market is like, investing in Asbury is and will probably always be, a form of gambling. The city’s corrupt developers and corrupt politicians have screwed over so many so often that it seems highly likely that someone, somewhere in Asbury Park is going to eventually lose a ton of money. As an aside, wouldn’t it be nice to see some businesses return to Asbury after fleeing 30 years ago. Maybe companies like the Asbury Park Press should try to help in the rebirth in Asbury by coming back to town instead of hiding in the woods of Neptune. “Paramount had a waiting list of more than 3,000 people for their first buildings in their portion of the waterfront development area, which they named North Beach Asbury Park. 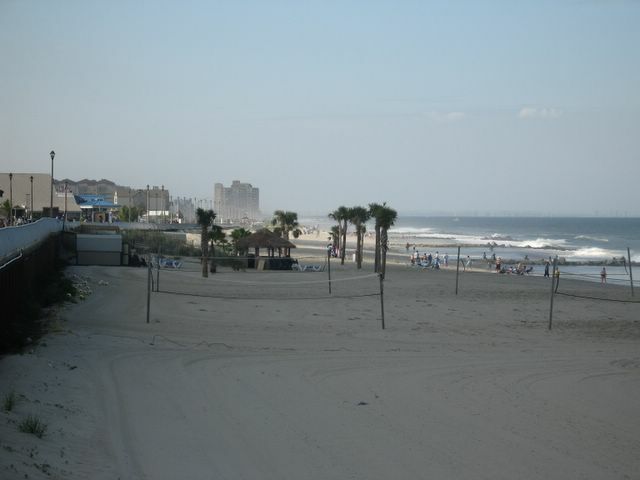 "I always had the dream to own beachfront property down the Shore," Rodriguez said Wednesday. "Asbury Park provides a means where we can have a second home. In the short term, it will be a second home, but in the long run I find myself living there. 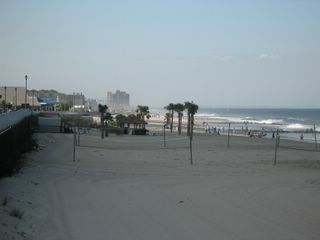 It is the Jersey Shore, and over time, it will definitely develop." A few weeks ago, Pimco’s Bill Gross said that he expects long-term interest rates to remain low and now Roach is heading in that direction. Even though Roach doesn’t seem to think that high interest rates will burst the real estate bubble immediately, he is still concerned that the housing market seems to be displaying maniacal like conditions. It is my understanding that people are buying those 1950s style motels in Seaside and Wildwood and turning them into small condos. Does anyone know if this is true? "There are more flippers here than in Sea World," said Jay Lamont, the host of All About Real Estate on WPEN-AM (950) for the last 27 years. Center City's exploding condo market and the Jersey Shore's vacation-home boom have fueled speculative buying. That's not to say there weren't investor-friendly markets before -- the mid-1980s was the most recent previous example. But this one is different, Lamont said -- and so are the flippers. "They differ from those of yesteryear in that they are generally younger, dumber, and move in herds like sheep to the slaughterhouse," he said. "Today's flippers are usually asset-challenged, so they don't have the cash available to actually settle on the would-be flip deal." Although I can appreciate this letter writer's sentiments, I think he is just going to have to realize that things change. Market forces are continuously at work and now property at the Jersey Shore is worth more than it ever was. As a result, it is priced out of the reach of most people. The only problem I see with new development at the shore is when it is subsidized by the goverment. These subsidies include the eminent domain abuses taking place in Long Branch and the beach replenishment projects. "Buyers of the new supersized homes seem to be saying, "Just give me my beach house and my beach view and everyone else can get lost." Visitors who previously were content to enjoy the Shore now seem determined to take over the Shore. They are systematically destroying so much of what they came here for in the first place. Soon the entire beachfront will resemble Spring Lake: quiet, clean, meticulously landscaped and oh so boring." The Star Ledger has an extensive article about the p/e ratios of houses in North Jersey. Needless to say, ratios are pretty high compared to only a few years ago. And yes, I know that the Newark Star Legder dropped the "Newark" from its name years ago. "# Nationally, the residential real estate market's P/E is 17, well above the historic norm of 11. # In the Newark metropolitan region -- a five-county span that includes Essex, Union, Morris, Warren and Sussex -- the residential real estate market's P/E topped 18.4 -- compared with just less than 11 five years ago. During this same time frame, home prices have risen 13.3 percent, while rental rates have only increased 1.4 percent, according to Zandi. # In the Middlesex-Somerset-Hunterdon area, the P/E is 19.1, compared with 11.6 five years ago. Here, home prices have climbed 15.2 percent during the past five years, while rental rates have only inched up 2.3 percent." The housing bubble is undeniable to me, but I concede that prices might not face a sudden and recognizable drop, or like the paragraph says below "a flash from Zeus' bolt." However, I don't doubt that the price correction in house prices we are all looking for can be accelerated by all of the recent media and blogger attention. "It may not happen next week or even next year, and it may not happen in a flash from Zeus' bolt in a 20 percent tumble, but the evidence is undeniable: Many real estate markets around the globe are being driven to the precipice the way a drunken 14-year-old video game addict might drive a Humvee on Devil's Slide. It's an accident waiting to happen." This is from a London newspaper. Given the crazy prices for co-ops in NYC, it should be no surprise that many New Yorkers have headed for Monmouth County instead. "But in the last two years there has been a notable shift. With the stock markets still a pariah and interest rates so low, property became the new speculative asset class. I now live in Williamsburg, a horrifically trendy part of Brooklyn. I moved here because it was cheaper, slightly, than where I lived in Manhattan. Now warehouse properties here are selling for as much as flats in Tribeca. Prices are even going through the roof in Bed-Stuy, a horrible and inconvenient area of Brooklyn with some lovely buildings and a nasty crack habit. The property fetish has even reached South Bronx, once the scariest part of New York City and scene for the opening clash between rich and poor in Tom Wolfe’s Bonfire of the Vanities. South Bronx is now, inevitably, being called SoBro and is home to artists, writers and restaurants selling rocket and pear salads." Monmouth County Foreclosures for June 27, 2005. Down 7 for the week from 41 to 34. This house is now listed on the MLS for $875,000. It was recently priced at $899,000, which was down from $940,000 back on May 5th. Like a broken record, Morgan Stanley’s Stephen Roach makes his case again that we are in the midst of asset bubble of historic proportions. The government released the “New Residential Sales” data for May 2005 today. The headline number was pretty healthy as expected. Nationally, the May 2005 sales number of 1,298,000 was 4.4% higher than the May 2004 number of 1,271,000. Also, May 2005 sales were up 2.1% compared to April 2005. Looking at the data on a regional level is a little less bullish. In the Northeast, where the Jersey Shore is, New Houses Sold and For Sale declined 28.2% from May 2004 to May 2005. On a sequential quarter basis, sales declined 24.5%. In summary, the total national number was pretty strong but for our region of the company, the comparisons were pretty weak. Here is a link to the government website. “Experts say the first signs of a bursting housing bubble include falling sales volume, but prices that don't immediately drop - exactly what the latest Massachusetts real estate figures show. The Massachusetts Association of Realtors reported yesterday that single-family house sales fell 11.1 percent in May - the worst decline in almost three years. But median house-sale prices actually rose 6.2 percent, hitting $359,900. I would guess this bridge in Locust has been under construction since last August. It's not a big bridge at all, but construction of it has been extremely slow. Now I see why. It looks like there is actually only one person working on it. Here is the owner of Danny's steakhouse in Red Bank writing about local real estate prices. His comments are right on the money. "How about the prices on homes in the area lately…they just about knock your socks off when you ask how much. I know it was ten years ago but I sold a house on Hill Top Terrace with an acre of property, 11 rooms and out side porches for $250,000. The house sold last year for $675,000 and God knows what it is worth just a year later. We in this area could all sell our homes for a profit but where would we go? The neighbors on Irving Place got a jolt when a house on that block sold for $1,100,000 just two months ago. The house was purchased for about $470,000 three years ago. The owners worked their butts off to totally renovate the home over the past three years. The entire house was redone with new multiple colored wood floors, new dark rich wood molding throughout the entire house. Every room was re done as well as richly stoned garden both front and back of the house. New modern kitchen and baths were installed along with new doors and windows. The end result was the price tag it sold for." Australians also use the term McManison to describe oversized houses. Western Monmouth County is probably the heart of McMansion country in the Shore area, although those houses were built on old farmland. We are also seeing McMansions replacing older construction in some of the eastern Monmouth County, especially in Little Silver and Shrewsbury. I would not exactly call the big houses going up on old lots in Rumson “McMansions” since many of the lots and older houses there are already big to begin with. Many houses in Rumson, for the most part, are real mansions. ["McMansionisation" is especially prevalent in wealthy towns with a hot real estate market. "It goes on all over the country in select neighbourhoods," said Robert Lang, director of the Metropolitan Institute at Virginia Tech, which tracks urban growth trends. "It's reached a critical point." The Supreme Court of the United States ruled yesterday that the government can invoke eminent domain rules for economic purposes. This would give the City of Long Branch the legal protections and justification for there recent eminent domain abuses along Ocean Avenue. “WASHINGTON -- A divided Supreme Court ruled Thursday that local governments may seize people's homes and businesses against their will for private development in a decision anxiously awaited in communities where economic growth often is at war with individual property rights. The National Association of Realtor’s chief economist expressed concern about the use of exotic mortgages to fund the purchase of a house. He has generally been pretty bullish about housing, as is to be expected since he works for realtors, however, in recent weeks he has been a little more cautious. ["Expectations of even higher prices are also contributing to strong sales and creating bubbly conditions in some regional markets," Nariman Behravesh, chief economist at Global Insight, wrote in a research note. Federal Reserve Chairman Alan Greenspan, while discounting the possibility of a national housing bubble, has talked of "froth" in local markets that have seen a sizable run-up in prices over the past year. He has also expressed concerns that home buyers are using types of mortgages that allow them to purchase more expensive homes with less of a down payment, leaving them vulnerable if prices do fall sharply. NAR's Mr. Lereah said he too was concerned about the reliance on interest-only mortgages and other types of loans that are offered with low down payments. Such financing would leave borrowers vulnerable if home prices started to slide in areas where price increases have been the greatest. This summation on Prudentbear.com of a Bear Stearns’ piece shows you why we are currently in a housing bubble. • Easy Money – After years of “ample financial liquidity,” money supply growth starts to slow about three years before the peak of the bubble. • Strong Economic Growth – Bear Stearns found that nonresidential building activity was a great proxy for economic activity and usually peaks two-years before the bubble peaks. • Prosperity – It should not be surprising that personal wealth accelerates during an asset bubble and peaks when the asset bubble peaks. Last week it was 2728. The Economist has been doing a great job of tracking the housing bubble both in the US and overseas. Many believe that the bubble is international in scope and that a plunge in worldwide housing prices threatens to send many local economies into a recession. Some of the areas that are showing signs of weakness in the past few months include the UK and Australia. In this country, a lot of people are looking at the San Diego, San Francisco, Miami and Las Vegas markets for signs of an eventual housing price collapse. If I had to guess which towns in the Shore Area are likely to fall first, I would put my money on all those condos and townhouses going up in Long Branch. Also, some of the McMansion type developments in Wall, Howell and Freehold might also be worth watching for negative price changes. The houses in some those developments look pretty large and I can just imagine someone paying up for size at the expense of a longer commute. The Asbury Park Press has a number of letters today from residents of Long Branch who are angry that they have lost or are losing there houses to eminent domain rules. Although I agree with the mayor that the area in Long Branch in question, which is along the ocean in the north part of town, needs improvement, I don’t think invoking eminent domain rules is the way to change it. By invoking the eminent domain rules, the city of Long Branch is essentially subsidizing the profits of the developers. If the developer thought it was so important to build condos along the ocean, than he should pay the full market price for the property, not have the government seize the property. The writer in this article summarizes nicely how the Shore has changed recently. It seems that this area is becoming more unaffordable each year for a lot of people. It seems like it would be virtually impossible for a family of three or four to buy a house in almost any Monmouth County town if they didn’t earn at least $150k per year. The writer doesn’t say though, and he probably does not recognize it, that the problem of being unable to afford a house is pretty widespread along the coasts of this country and is not limited to the Jersey Shore. This article points out that you never really know that you are in a bubble until it’s too late. Also, the article has an abridged analysis by Grant’s Interest Rate Observer, which believes we are in the midst of a bubble. “Grant's Interest Rate Observer, a highly respected New York newsletter, recently offered a smart analysis by a real estate consultant in Hawaii. He multiplies the number of home sales by the average price, then divides the result by the nation's gross domestic product. This shows home sales as a percentage of the economy. Where Are The Armies of Homeless? The home builders and other perma-bulls all say the same thing; that the supply of homes is limited. If the supply of homes is limited, then where are all of the homeless people? I don’t think this is a completely disrespectful or nonsensical question. If there is a shortage of housing, then there clearly should be more people living on the streets. What the home builders and housing bulls don’t appreciate is that a sufficient amount of housing does exist when you don’t distinguish between renting and owning. “But in a report to be issued today, the Anderson Forecast warns that the construction of new homes is outstripping the natural growth of the population. “NEW YORK, June 21 (Reuters) - U.S. residential mortgage delinquencies and foreclosures edged down in the first quarter of 2005 from a year earlier, a mortgage industry group said on Tuesday. This press release was issued to promote a new website called www.condoflip.com. It sort of reads like a joke. After all, no one wants to be caught in a panic selling situation, which is what this press release implies will happen, almost as a given. It says that there are condoflip franchises available, maybe the Jersey Shore needs this too for all of those new condos in Long Branch and Asbury Park. “MIAMI BEACH, Fla.--(BUSINESS WIRE)--June 21, 2005--Mark Zilbert, a nationally recognized authority on residential real estate, today announced the launch of Condo Flip(TM) - http://www.CondoFlip.com, a revolutionary online marketplace where buyers, sellers, brokers, real estate agents and developers can meet to "flip" pre-construction condominiums. Flipping refers to the resale of a pre-construction condo before the original buyer takes possession of the unit. "Homebuilders led the stock parade this week with a fantastic 11 percent gain. This is a group that hedge funds and bubbleheads love to hate. All the bond bears have been dead wrong in predicting sky-high mortgage rates. So have all the bubbleheads who expect housing-price crashes in Las Vegas or Naples, Florida, to bring down the consumer, the rest of the economy, and the entire stock market." I was trying to get through Fair Haven on Saturday morning, but the George Sheehan Race was going on, so I had to maneuver through all the back streets to get to the south side of Ridge Road. In any event, I noticed “For Rent” signs on three or four different houses in the borough. Although you always see For Sale signs, I thought it kind of odd to see the for rent signs. I wonder if these rental properties are a sign of anything, or maybe they mean nothing. One of the first “signs” I expect to see when the bubble bursts are lots of “for rent” signs on condos and townhouses when the speculators discover they can’t flip them for more than they paid. Speaking of rental properties, checking the classifieds this weekend, I noticed that at least two of those brand new condos in Long Branch that are located right near Rooney’s Crab House are for rent already. The rents seemed pretty reasonable (less than $2800 per month) especially relative to what the monthly mortgage payment would be. Those condos have a listed starting price of about $600k. Assuming a $540k mortgage at 6% for 30 years brings the monthly mortgage nut to $3235. If you figure the property taxes are about $7000 per year ($583 per month) and the monthly maintenance is about $400, than I estimate the total monthly cash outflow to own one of those condos would approximate $4200. If you subtract out the tax benefit, assuming an effective rate of 25%, you would save about $820 per month, which would bring the per month cost to own to about $3385. Like I said though, you can rent out the same place for less than $2800. Look, this is the area I’m talking about. They only want $2,200 per month. “Home prices may plunge as much as 25 percent when mortgages suddenly balloon in the coming surge in borrowing costs, says an economist. This post on this blog says that realtors should all be bloggers. The Federal Reserve sounds like they are specifically targeting the housing bubble by raising interest rates. The various Fed. Governors and Presidents seem to be out there every day saying that they intend to continue to raise rates. “TOKYO, June 20 (Reuters) - Federal Reserve Bank of Minneapolis President Gary Stern sees no reason for the Federal Reserve to stop raising interest rates now as the economy expands at a desirable pace, a Japanese newspaper reported on Monday. Today’s Wall Street Journal continues the papers in depth coverage of the housing bubble. (Subscription required for the WSJ website.) One story says that even though the bubble might not be national in scope, the places that are experiencing fast price rises encompass a huge sector of the population, which practically makes the housing bubble everyone’s problem. “New federal housing data show that the nation's most overheated local housing markets now make up such a large share of the total U.S. market that a sharp fall in their values could stall or slow national economic growth. The NY Times carried a story the other day about how single people are moving to the suburbs. The actual story itself is not worth reading, especially since Hoboken is referred to as a suburb. However, the critique of the story at this blog is pretty funny. This professor out in California decided to sell his house and make a few bucks. "A professor of public policy at the UCLA School of Public Affairs, Kleiman, 54, announced on his weblog three weeks ago that he was, in a manner of speaking, shorting the Los Angeles housing market. He had just accepted an offer for his 2,700-square foot, four-bedroom Mulholland Drive home that would net him roughly a 62% gain over the price he paid in 1997 and the cost of a sizable remodeling in 2001. The deal closed last week, with the buyer acquiring a hilltop property with a picture-window view across the San Fernando Valley and a recently installed outdoor spa"
Reg X seems a little extreme. Additionally, I doubt Congress would ever summon enough courage to bring back this type of Regulation. "Greenspan is certainly not leading a charge to take any action to thwart the housing bubble. If he was serious, he could ask Congress to resuscitate Regulation X (part of the Defense Production Act, passed in September 1950), which empowered the Fed to set minimum downpayments and maximum mortgage-repayment periods for residential properties. (However, the Federal Deposit Insurance Corporation (FDIC) and the Office of the Comptroller of the Currency (OCC) have come out against perceived abuses in mortgage lending, citing interest-only and negative-amortization mortgages.)" The article suggests that the aggresive lending practices that are part of the cause of the housing bubble could have a detrimental effect on banks, like in the 80s. I doubt that we will have rampant bank failures when the current boom ends, since most banks, it seems, sell their mortgages to Freddie, Fannnie and others. On the other hand, it seems very possible that Freddie and Fannie could fail, or require a taxpayer funded restructuring. Also, buyers of Fannie and Freddie securities, such as hedge funds, mutual funds, pension funds and overseas investors, could get hurt. As long as were on the subject of the '80s, remember when WHTG 106.3 was the best radio station at the shore? "The office of Federal Housing Enterprise Oversight reported that the average U.S. home price rose by almost 11 percent in 2004, up from 7 percent in both 2002 and 2003; and that the number of boom markets increased by 72 percent last year to now include 55 metropolitan areas. These housing boom markets included 21 cities in California, 18 in the Northeast and 11 in Florida. A similar occurrence happened during the market boom and bust of the late 1980s, which followed the collapse of more than 750 savings-and-loans and cost taxpayers millions of dollars. The failure of the banks was blamed by many in part on their aggressive real estate lending practices that led to foreclosures across the country." Part of me would like to side with the people who want to limit development in the Shark River area, if only to limit the sprawl. On the other hand, if I owned the land, and the government was about to make my investment worthless, I'd probably be out there planting soybeans myself this weekend. "TINTON FALLS — Plans by H. Hovnanian Industries to lease property it owns on Route 66 to a farmer who plans to sow soybeans could exempt the property from compliance with strict new development restrictions that take effect Monday. H. Hovnanian, which has offices on Route 66 near the Garden State Parkway, has cleared a swath of land directly behind its office building and up to the banks of a Shark River tributary, and leased it to a farmer, said Ines Grimm, manager of the Freehold Soil Conservation District." When they Oceanic Bridge is taken out of commission for replacement or repairs, the ride from Rumson to the Highlands ferry is definately going to take longer. I do like the idea of leaving the bridge at a shorter height though. "RUMSON — Local borough councils are taking up the fight to keep the Oceanic Bridge from growing to new heights. With the Monmouth County Department of Transportation looking at several different plans to replace the historic but deteriorating bridge, including one that would increase the height of the structure to 70 feet, the borough councils of Rumson, Fair Haven Little Silver and Middletown have passed resolutions opposing a larger, fixed bridge. As the Oceanic Bridge stands now, it reaches only 50 feet at its highest point and its drawbridge has to be opened to allow taller vessels to pass through." Foreclosures listed in Monmouth County is down 2 this week to 41. I have a feeling that the two women in this story are eventually going to experience a reversal of fortune. I guess that is what a lot of us here are betting on. The women without the townhouse should spend more time on the Internet so she could see the hundreds of reasons why renting is not that bad now. [“But there is one big difference in their financial fortunes that divides the two friends sharply: Call owns an Alexandria townhouse, bought two years ago, while Dressendorfer remains a renter. As a result, Call is worth substantially more than her friend. It's true Dressendorfer has more savings than Call, who has spent most of her savings fixing up her townhouse, making it home. But, as Call says, "there's no way she could've saved as much as I've made on my townhouse," which she said has appreciated in value by approximately $150,000. As an aside, I though this line was funny from the article. The line is almost oxymoronic. Washington DC is such a “hard-charging city” with so many “entrepreneurs” working for the Bureau of Labor’s Office of Acquisition Management Services Division, or the customer relation department of the IRS. It’s a real cut throat town when there are only 378 second deputy directorship positions available at the Bureau of Indian Affairs’ Administration of Oregon Territory offices. As we continue to look for signs of a slowdown in house price appreciation around the shore, it helps to keep track of other hot housing markets. San Diego seemed to be one of the hottest last year, but now it looks like it is starting to cool down. “Sales of San Diego apartment complexes plunged in the first quarter, as rising prices kept more investors on the sidelines, according to a report from Burnham Real Estate Services. The Form 4 is filed with the Securities and Exchange Commission by insiders to report transactions in their companies' shares. Open market purchases and sales must be reported within two business days of the transaction. [Still, anecdotal evidence suggests that some people have cashed out and many more are thinking about it. "It is something that we may start to see a little bit more of" as prices keep heading higher, Cook says. Consider Penny Dorneman. She and her husband recently sold their Connecticut home and moved to Boston. But instead of paying top dollar for a home in Red Sox nation, they banked their $128,000 profit and rent a $2,885-a-month apartment. "Prices are insane," says Dorneman, 47. "Is Boston really a 20-times-better place to live than someplace else?" Does anyone know if the line, below, about affordable housing being a constitutional right in NJ is true? If it is true, why does this “right” exist? It sounds like some kind of right dreamed up by macramé wearing hippies circa 1971. Shouldn’t this right, if it exists, be repealed before some crooked judge from Hudson County forces people that own summer beach houses to sell them to his developer friends? “New Jersey is one of the few states that recognizes affordable housing as a constitutional right. Unfortunately, the need for affordable housing is not being met. New Jersey must address this problem so that the less fortunate are not left behind by our state’s rising property values. 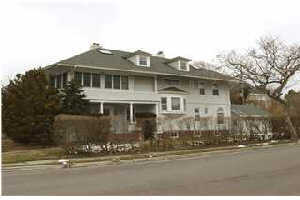 "Allenhurst ocean block seashore colonial original listing in Feb. $3.499.000- now reduced to $2,999,000 (MLS 10024698). Look out below!!!!!" The Royal Institution of Chartered Surveyors has some concern about the housing market in the UK. I don’t know why they should be concerned, England is an island, and “they are not making any more land”, housing prices should continue to grow there forever. “Estate agents and surveyors were more pessimistic in May about house prices than at any time since November 1992, the Royal Institution of Chartered Surveyors reports on Tuesday. This MarketWatch article from yesterday mentions that a preponderance of “scattered anecdotes” could set the stage for eventual housing price declines. Here are some “scattered anecdotes” I have heard but cannot and will not vouch for. -Older Rumson families are cashing out and moving to the hills in Atlantic Highlands where its cheaper and the views are better. -The new condos and townhouses in Long Branch along Ocean Ave. are being bought mostly by local realtors and speculators. -The McMansions of Marlboro, Manalapan and Millstone, were designed with huge vaulted ceilings because many purchasers could never afford to furnish the vaulted “space” if it were actual rooms. -One realtor told a potential buyer I know that price appreciation will only slow to about 8% a year after the buyer suggested houses might be cheaper next year. “NEW YORK (MarketWatch) - It may not take rocketing interest rates to pop the housing bubble now seen in patches of the country, according to Ethan Harris, chief U.S. economist at Lehman Brothers. The manic buying spree and escalating prices could all be brought to an end by a simple but severe case of investor nerves, he said. Are There Really That Many People Moving Here? Are there really that many people moving to the Shore that someone thinks they can make a killing building apartments in the middle of nowhere. Monmouth County is going to have the population density of Queens in a couple of years. “TINTON FALLS — Two people were ejected Wednesday night from a special Planning Board meeting called to hear an application for 298 apartments proposed for 35 acres on Route 33. Traffic on this site has been growing pretty steadily over the past few weeks. Although there is a lack of commentary here so far, you can certainly see a huge number of comments being left on www.thehousingbubble2.com website, which is indicative of the growing popularity of the subject of housing bubbles. The guy sitting in front of me exuded all sorts of "poor-service musts" found in my pink pamphlet. Slouching with his arms crossed on his chest, he had the "act put-out" look down pat. He made no eye contact, hiding behind a pair of dark shades. His hygiene screamed "hungover frat boy forced to get out of bed hours before he was ready." It didn't bother me much, but I could see how tourists might prefer a more personable, less scruffy server. Could Mr. $1 Domestic Draft see it? And if he's working down the Shore only to make money and meet girls, should he even care? "Housing bubbles don't collapse suddenly. They go through a long series of self-reinforcing deflationary stages that typically last five to seven years. Given the extreme and unprecedented nature of the current housing bubble, I expect a ten- to fifteen-year downturn to follow this boom. The government will step in with all manner of supports and bailouts along the way, similar to those that created the bubble in the first place, so the exact trajectory of the decline is impossible to predict. Here I estimate how and over what time period the decline may occur." There were 2728 listings on the MLS system as of today. We'll try and keep track of the amount of houses listed to see if a trend develops. Here is the link to the number. 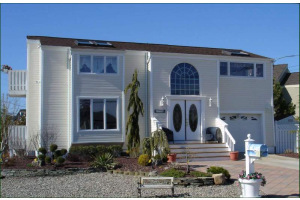 Eastern Monmouth County MLS listings. 1. Robert Schiller – Yale Professor, wrote Irrational Exuberance and predicted the dot-com bubble. If the yield curve continues to flatten, or eventually inverts, mortgage rates do not have to go to 8% to burst the housing bubble because banks will just stop writing new mortgages. Unlike most analysts who cite rising long-term interest rates as the only threat to the real estate bubble, Mr. Trahan recognizes that the flattening yield curve also poses a great threat. Banks love to lend when they can charge more to their borrowers than they are paying to borrow those funds – hence the appeal of a steep yield curve, where long-term rates are appreciably higher than short-term rates. "With interest rates at 40-year lows, and the yield curve flattening, lending conditions will likely become more difficult, removing one of real estate's most significant headwinds," Mr. Trahan said. One flashing red light is that the number of new homes for sale for which construction has not begun has never, ever been this high. Speculation, in other words, has never been more frenzied. And then there is the supply/demand dynamic. "Supply, as depicted by the amount of new homes for sale, seems to be increasing at the same time the home non-ownership rate seems to be near all-time lows and still declining," Mr. Trahan observed. "We are approaching a situation where there will be more homes built than there are prospective homeowners." Morgan Stanley’s Stephan Roach has been preaching doom and gloom for the US economy for a few years now. He has consistently maintained that the US consumer would eventually buckle from its high rate of consumption of Chinese goods once interest rates start heading up. Although Roach still believes this will happen, it may take longer than expected, and in the meantime, the American consumer may get one last final chance to spend the last of the equity in the houses they own before all hell breaks loose. Harvard’s Joint Center for Housing Studies released a report detailing the state of the housing market. Buying a house is desperate and frenzied according to the study and rapidly becoming unaffordable. Bonus points for who wrote the lyrics “…some hazard from Harvard was skunked on beers…” (hint – Jersey Shore). Double bonus points for naming the song. The number of properties on the Monmouth County, New Jersey sheriff's listing of recent and future foreclosure sales increased 3 this past week to 43. The Wall Street Journal had a good story about vactation home prices. (A number of papers syndicated it.) Aside from California, some of the hottest markets are in Jersey, including Brigantine, Ocean City and Lavalette. A year and a half ago, David Krahn had never been to the Jersey shore -- but he plunked down almost a million dollars to buy a house there anyway. Why? The Philadelphia utilities analyst had heard home prices along the shore were booming. So, for $990,000, he and a business partner bought a four-bedroom oceanfront townhouse in Brigantine, N.J., a barrier island about an hour away, to use as a summer getaway and part-time rental. ["I've heard of lots of people talking about the 'bubble,'" Ralph said. "I was just at a seminar where some predicted a drop in house values. I find the opposite. I think the market is in great shape. Fleckenstein is one of the earlier commentators to critique Greenspan for printing too much money too fast. [For once, there was a somewhat intelligent (though incomplete) discussion in the mainstream press about how the Federal Reserve bailed out the stock bubble with a real-estate bubble. 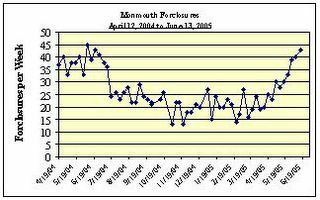 Out of all mortgages in Monmouth County in 2004, 14.3% were interest only, which was tied with Miami. This is well below the national rate of 22.9% and not nearly as bad as in California, where the rate approaches 50% in some cities. As this blog points out, fixed 30 year mortgages are already incredibly low, so what's the point of getting a cheaper ARM. "This is bad news, because an interest rate of 5.5-6.0% is not that high... and yet it's too high for many recent home buyers. If 1-year interest rates to rise by just 1.5%, millions of recent home buyers will find their mortgage payments unaffordable. Yet there are plenty of reasonable scenarios that raise 1-year interest rates by that modest amount in the next year or two... which means that we shouldn't find it surprising if millions of recent home buyers soon find themselves unable to afford to live in their own houses." The graph on this site lookss like the Unaffordability Matrix that I made. In either case, both graphs illustrate how much mortgage some one could afford given a change in interest rates. Spec Houses in Westport CT. Interesting comments on houses being built on spec. in wealthy Westport Connecticut. We are seeing alot of this kind of building in Rumson and Little Silver. "While not an Achilles heel for Westport, houses built for speculation, especially those in the $2 million plus range, are increasing inventory, according to real estate agents. This causes houses to remain on the market longer, which in turn forces sellers to be more competitive, and ultimately affects the price. "What we're seeing is a lot of new construction and increased inventory over $2 million, and only about 25 percent of them are selling," said Michele Genovesi, owner of Michele & Company at William Raveis in Westport." "Some economists think Myrtle Beach could be headed for a bubble, but local real estate analysts say the area's market just recently got hot, fueled by the kind of national recognition needed to join the ranks of booming housing markets in other parts of the country. Dramatic increases in first-quarter condominium sales and the number of building permits issued locally concern some analysts while others say the Grand Strand's condo market simply wasn't so good last year and this year's numbers show healthy growth. Sales of new condos quadrupled during the first three months of this year - to 1,101 from 282 - according to Market Opportunity Research Enterprises, a real estate market research group in Rocky Mount, N.C."
[In fact, IO loans are bringing to the housing market a risk factor that few home buyers have faced in the past, creating the potential for a whole class of owners who could, five or so years from now, find themselves unable either to make their mortgage payments or to sell their houses. It's a peril that worries Federal Reserve Chairman Alan Greenspan. And if it worries him, it should worry you. Paul Volker saved this country in the early 80s from spiraling inflation. In a recent speech, former Federal Reserve Chairman Paul Volcker voiced his concerns for the future the American economy and that of the rest of the world. Among other things, Volcker warns of a possibly dramatic shift in the relationship between U.S. consumerism and foreign investment – and the dire consequences that would have on Americans. * In regard to the U.S. economy, Volcker sees "disturbing trends: huge imbalances, disequilibria, risks..."
* He says these are the most dangerous economic conditions he has ever seen – and, he notes, he has seen "quite a lot." * Though businesses are rebuilding their financial reserves, in only a few years, the federal deficit has offset all that savings. * Home ownership has become a vehicle for borrowing rather than a means of financial security. * In the U.S., we consume and invest about 6% more than we produce. * The U.S. economy is held together by a foreign capital influx of over $2 billion each day. This issue has been going on for some time in Long Branch. It seems like the City of Long Branch is subsidizing wealthy developers by enacting the eminent domain process. Australia and New Zealand both experienced a sharp run up in housing prices and now many believe that prices have begun to “stagnate” or fall. Since the bubble in that area of the world is supposed to have started before our bubble did, many believe that prices here will follow the same pattern as in Australia and NZ. The 4% yield on the 10 year treasury makes absolutely no sense to me. We wrote about this company last week I believe. I like the idea of being able to hedge the price of your house. It looks like you might need to take a pretty serious position if you wanted to be fully hedged though. ["Prices on HedgeStreet become pretty interesting predictors of market consensus," Russell Andersson, co-founder of the company, said. "Participants are expressing their views on the future of housing markets and that's valuable information." Here is a disgusting story about the lack of bathrooms in some towns on the shore. Towns that want lots of tourists have lots of bathrooms and towns that don’t want tourists definitely try to limit the number of bathrooms. Pitching an 8 person tent in the middle of a crowded beach, or soon to be crowded beach. Screaming when you see a horseshoe crab. Playing your radio too loud near others. Playing with one of those football toys that whistle when it is thrown. Barbequing in the parking lot. Shore Municipalities and the employees who work the beaches also deserve some suggestions. If you are going to insist on charging $7 or $8 a head to get on your tax payer built beach (Sea Bright) than have the decency to empty the friggin’ garbage cans more than once a week. This is an article that was originally published two days ago in a number of different newspapers across the country and on the Internet. For whatever reason, the Asbury Park Press decided to run it in today’s business section. So even though this story is two days old, some Jersey Shore residents might not have seen it. As for the Asbury Park Press, some original reporting would be nice occasionally instead of the usual AP wire stories and Ganett syndicated columns. Also, thank for removing the annoying Jason’s Furniture pop-up from your website. [SAN FRANCISCO — Once a frustrated renter, Chris Economou is now a happy homeowner, enjoying a splendid view of San Francisco and an $80,000 increase in his property's value since he bought the one-bedroom condominium for $435,000 a year ago. He credits his good fortune to an interest-only mortgage, an increasingly popular — and risky — loan that enables borrowers to lower their monthly payments enough for several years to afford rapidly escalating home prices in expensive markets like the San Francisco Bay area. Economou estimates he saves $1,000 a month by having his interest-only mortgage instead of a traditional 30-year fixed rate loan. The reaction by the “borough officials” reminds me of the scene from Jaws when none of the “village officials” wants to call attention to their local shark problem. [SURF CITY — A 17-year-old surfer from Lacey Township said he was bitten by a shark Sunday while surfing off 18th Street. "I was surfing. I was up, and then I fell off and it felt like a baseball bat had whacked my foot," said Ryan Horton. "He bit into my foot and tore off a big part of flesh and skin." A few weeks ago I got some sort of property tax rebate from the state for $25.00. I’m not sure what I did to get my money back, but it was not quite enough to offset the $11,000 I paid in property taxes in 2004. We have the lowest mortgage rates in 40 years and no one wants to lock in those rates by taking out a 30 year mortgage. Instead, they go for the temporarily cheaper payments of 5/1 ARMs and negative amortization loans. “Take a $385,000 house, assume a 20% down payment ($77,000) and a 30-year, fixed-rate mortgage at 5.75%. You, the homeowner, would write a check for $1,800 a month. Over five years you'd wind up paying the bank a cumulative $108,000. Now take the same $385,000 house, the same 20% down payment and the same 30-year maturity. But instead of a fixed-rate loan, assume a 5/1 interest-only ARM. For five years you pay a fixed rate--say 5.1%. That's $1,300 a month. Over the five years your cumulative payment would amount to only $78,000. This writer starts off about the guy in south Jersey who recently put up a billboard that says the state is a rotten place to conduct business. But for most of the article he makes some interesting observations about the differences between south Jersey residents and north Jersey residents. Question – What town or physical landmark on the Jersey Shore is the demarcation line between where south Jerseyans primarily go in the summer and where north Jerseyans go? Essentially any beaches that are south of LBI, but not actually on LBI is southern Jersey and Philly territory. All points north of LBI to Sandy Hook, including LBI is north Jersey and New York territory. [In order to understand what I’m getting at, you first have to understand New Jersey. And in order to understand New Jersey, you have to understand that New Jersey doesn’t really exist. Oh, maybe in the technical, geographical sense it does. Mapmakers certainly recognize it. And it certainly has its own license plates. But actual New Jerseyans know “New Jersey” is a misnomer—an oversimplification, if you will. You see, there are actually two New Jerseys—North and South. I’m from North Jersey. And, yes, there’s a difference. This article says that some believe all the talk about the housing bubble is a Wall Street talk to shift peoples money from real estate back into the stock market. The author straightens things out though. As of the latest numbers, home sales as a percent of the economy are at 17%. For the statisticians out there, that's 3.4 standard deviations from the mean. For the non-statisticians out there, speculation in home buying is literally off the charts. Said another way, it's not a Wall Street conspiracy that speculation in housing is at a statistical extreme; it's a fact." For a while I thought that Wall Street bonuses were driving property values higher in the City. However, this year, except for maybe a few hedge fund managers, I don’t think there was much bonus money to distribute. For one, the past 12 months have been pretty poor for underwriting. As a result, I don’t think that a significant amount of new stock and bond placement fees (underwriting) were generated. Also, the stock market has been in a rut for probably about the past 12 months with no volatility. When there is a lack of volatility in the stock market, that means there are fewer opportunities for traders to trade. Maybe some other sectors of Wall Street are doing particularly well that I am unaware of. "Look, up in the air! Is it a bubble? Is it froth? It's Manhattan real estate prices. But if there is kryptonite out there that could bring the gravity-defying housing market crashing to earth, it has not surfaced yet, as sales prices for apartments hit new highs last month. The median price for all sales in Manhattan that closed last month was $750,000, which was 23 percent higher than the median price for May 2004, according to a monthly market report prepared by Halstead Property, a real estate brokerage. The average price also reached a new high, at $1,276,202, which was 34 percent higher than the average price the same month a year ago. The report is based on 674 sales of co-ops and condos. Sales in May were generally the product of contracts signed two or three months earlier, so the figures most accurately reflect market conditions in the first few months of the year." Compared to real estate investing, stocks seem like the proverbial red-headed step child. No one is talking about stocks and real estate is getting all the media attention. In my opinion, the lack of interest by the public in stocks implies they might be reaching an “oversold” condition. [Still, the historical real estate data show blips and dips, but over years they tend to smooth out to an upwards-trending curve--just like equities. Even where they do decline, however, real estate prices tend to be stickier on the way down than on the way up, because home owners are more reluctant to sell in downturns. That is the answer to the question; why do rates on longer dated bonds continue to fall? Unfortunately, the people giving the answers described above all seem to be Federal Reserve Governors, or the people that are paid to know the answer. [WASHINGTON - Federal Reserve Chairman Alan Greenspan said yesterday that he does not have a good explanation for why long-term interest rates have been falling at a time when he and his Fed colleagues have been raising short-term rates. [WASHINGTON, June 7 (Reuters) - U.S. bank regulators have observed slippage of loan underwriting standards for home equity lending and commercial real estate loans, a worry for banks if house prices drop, Federal Reserve Board Gov. Susan Bies said on Tuesday.